The project aims to make a significant, transdisciplinary contribution to applied research on the prevention of plastic discharges into water bodies via drainage systems from a behavioural and environmental economics perspective. The idea and goal of Innoredux is to develop and implement innovative packaging solutions in distance and stationary retailing using a living lab research approach in order to avoid or reduce plastic waste along the value chain. Developing Countries in the Lead – What Drives the Diffusion of Plastic Bag Policies? 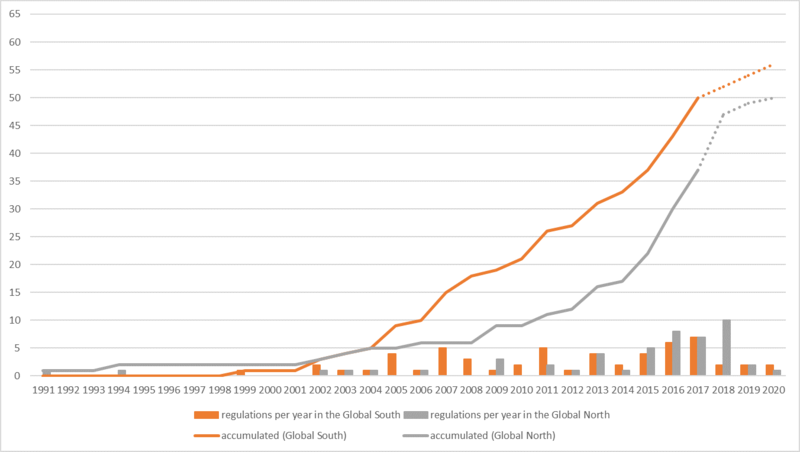 In this article, the authors analyze the diffusion patterns of plastic bag bans and plastic bag taxes in the Global South and Global North to contribute to the further refinement of diffusion theory by specifically addressing the under-researched Global South. Read more about Developing Countries in the Lead – What Drives the Diffusion of Plastic Bag Policies? On March 27, 2018 around 20 social scientists, all being involved in one of the research projects of the BMBF research programme “Plastic in the Environment”, met to network and discuss future possibilities to increase the visibility of the social and political dimensions of plastics in the environment. The REPLAWA project covers questions of water resource protection in connection with wastewater treatment. The project will investigate and quantitatively assess entry points into water bodies through treatment plants, storm water drainage, and combined sewer overflows as well as swales at treatment facilities and in sewage sludge. The methods currently available for the analysis of microplastics in environmental matrices are primarily designed for particles in the size range of 1 μm to 5 mm. Smaller particles below 1 μm have hardly been detected so far. However in contrast to larger particles, these are able to enter cells and have a higher potential for adsorption of pollutants due to their relatively larger surface. Consumers buying products made of or wrapped in plastic play a decisive role in plastic consumption in Germany. A complete avoidance of plastic in everyday life, while unlikely to occur in full, would only be possible with extremely high restrictions. Moreover, many consumers are not aware of how much plastic is put into circulation or into the environment by buying a product.